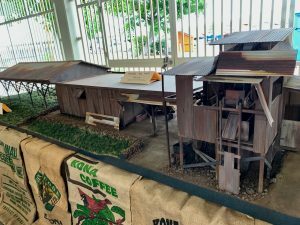 The coffee festival’s Ho’olaule’a, a day-long celebration of Kona coffee and its cultural heritage, was held at the Old Airport pavilion on Saturday. The community comes together, and you get a little of everything — music, entertainment, food, coffee tasting, vendors, ikebana, leis, activities, and exhibits. I liked the exhibit in this photo, which shows a mill and the traditional hoshidana, a sun deck for drying parchment coffee, with a roof on wheels that can quickly cover the drying deck in case of rain. On the model, imagine that roof on poles on the left rolling over the middle section with the “do not touch” sign. The parchment would’ve been spread in a thin layer & periodically raked to dry the beans in that “do not touch” area. When we were young, our grandpa’s brother & his wife (our mom’s aunt & uncle) lived across from our grandparents in a house with a hoshidana roof. (Our cousins have since built a modern house where that house with hoshidana used to be.) Our grandparents & their kids used to grow & pick coffee and process it to the point of dried parchment. They didn’t process it further, i.e., dry mill or roast coffee. This time of year, celebrating the harvest, this exhibit and the text that I copied below, remind me of our family’s own hoshidana and our family’s history. This is the first year of the Bea’s Knees Farm business and offering roasted estate coffee. It’s a personal Thanksgiving, not one of pilgrims, Native Americans and East Coast farm harvest as depicted in typical Thanksgiving images. I feel very deep gratitude to my ancestors and especially my extended family that I’ve personally known and interacted with. There have been so many people that have worked this coffee land, the ‘aina — my grandparents, great-uncle and -aunt, mom, aunts & uncles, cousins, and non-relatives. I bow to them all in gassho. Coffee farming was a family affair. Many family coffee farms were farmed primarily by a family comprised of two parents and 5 to 11 children. Having labor in the form of farm “hands” as was common on the North American continent during this period of the late 19th and early 20th centuries, or having ranch hands, as was common in Kona’s ranching community, was less common on Kona’s coffee farms. With the exception of lease-tenants, whereby tenant families would help their landlords bring in the coffee cherry during harvest, the farms were primarily planted, fertilized, picked, and milled and maintained by the family itself. Japanese families, Hawaiian families, families of European descent and other nationalities such as Filipino immigrants, Portuguese and others all became a vital part of the Kona Coffee farming community. Many early immigrants either worked or purchased themselves out of restrictive plantation work “contracts” and came to Kona to lease and farm coffee and build better, more autonomous lives for themselves. Although the work was arduous, from dawn to nightfall, it was rewarding and it was theirs to develop with their families.